The second update pack, known as Feature Pack 2, for the S60 was officially announced on February, 7 this year – this package brings about a bunch of critical changes that can change the way S60 platform is perceived by consumers. 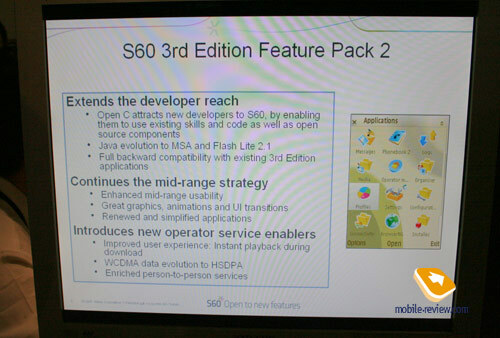 First offerings running on S60 3d Edition FP2 are to start shipping already in the Q3 of 2007 (approximately in September) – 3GSM attendees could get their hands on the feature pack on Nokia 6290, despite this device having a number of hardware caps (missing full-speed USB2, HSDPA). At present the FP2 is still being under development, and the version we saw wasn't the release candidate, anyhow it gives a comprehensive feel of what impending solutions will look like. It is impossible to update already existing devices running S60 3rd edition to Feature Pack 2 or swap software for FP2 modules!!! This is the question we are asked regularly, and the answer is one for all – no. 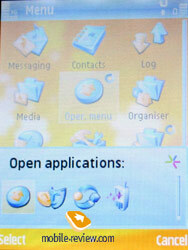 Open applications list is available not only with a long-press of Menu button, but also with the left soft-key. Inclusion of this menu item plainly tells us that the vendor wants to highlight its solution being multitasking-enabled, since many users are unaware of such ability on their devices, no matter how odd that sounds. 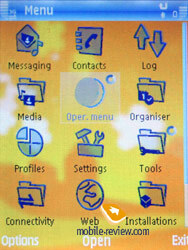 Horizontally arranged big icons in this task manager add some visual appeal to the interface layout as well. Three-button interface. Up until the FP2 all devices had only two captioned soft-keys, while now there are three of them, with the key in the middle usually serving for selection (OK, Select functions). In some sub-menus its functions may shape-change, but this is all another attempt to get the devices to be more user-friendly. 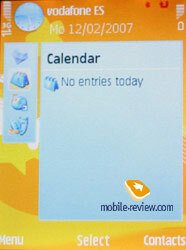 This interface layout doesn’t have a huge impact on the ease of use, at least for those already familiar with the S60. Active Standby. 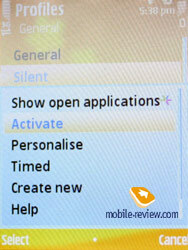 The interface of the Active screen has received a lot of tweaking – application shortcuts now may be laid out. not only horizontally, but vertically as well. 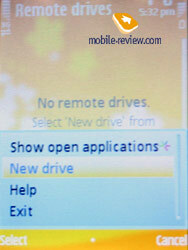 Selecting a shortcut (only for vertical view) the window on the right fills up with various options that have something to do with the picked application. For RSS/Atom feeds it is now possible to enable them at the bottom of the main screen. Overall, such layout saves a great deal of time when looking for a particular menu item. Caller ID. No need in applying FSCaller anymore – now the image assigned to a contact is displayed full-screen both on incoming and outgoing calls. 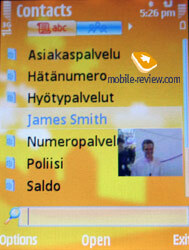 Phonebook can present you with entries stored in the handset’s memory and SIM card in one list. Should you happen to select a contact that has an image assigned it will pop up in a window, which is a good addition to the run-of-the-mill abilities of the application. Wallpaper and screensaver. 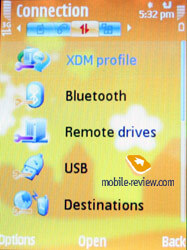 The user can go for any set of pictures, making them appear on the screen in slide-show mode, this feature is available for both the screensaver and the wallpaper. SMS/MMS. 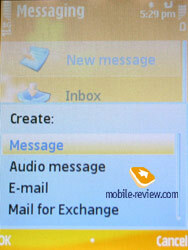 The maker has altered categorization, so that now Audio Messages (a variation of MMS) are composed in a stand-alone menu item, while SMS or MMS can both be created from Message menu. 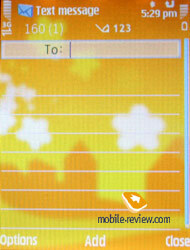 Depending on whether it contains text only or there are other constituents like multimedia content, the device automatically decides which format to send the message in. Temporary profiles. 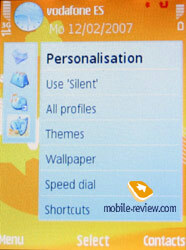 Much like the S40, the user can set up a profile to be active for the next 24 hours, and when its time is up, the handset automatically jumps back to the default one. Handy, isn’t it? Menu animation. 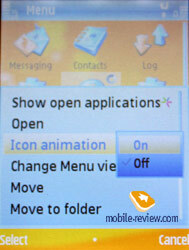 When entering sub-menus, switching between menu trees, the software shell presents you with some eye-candy animation snowflake, dancing on the screen or just an invisible hand turning over the pages. Menu animation can be enabled in Themes, the user isn’t capable of setting a specific effect for each menu, but I doubt this ability will be craved for. Icon animation. All items in the menu can get much more pleasant to look at, when Icon animation is enabled. In the version of the FP2 we had a chance to play around with, they look moderately fetching, but give you a general idea of what the whole thing might be. Download manager in browser. For multimedia files (music, video) the system creates a cache file, which it starts playback from until the content is fully uploaded – a welcome feature that was missing before. Open C. The very centerpiece of the update pack for developers, as they get 5 standard C libraries that can be utilized for writing new applications – as the team S60 claims, this will allow many companies to break into the S60 applications market. USB 2.0. At last handsets get support for full-speed USB 2.0, giving us about 5 Mb/s on local connection, which is an admirable figure. 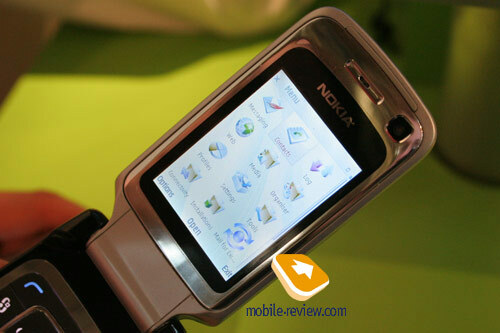 For the time being only Motorola ROKR E6 puts up identical speed. HSDPA. 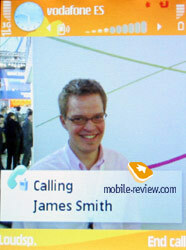 High speed data transfer support – nothing to shout about. Network Drive. 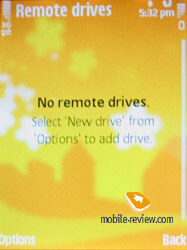 Ability to use your smartphone as a network drive, which is an altogether a very interesting thing to do. 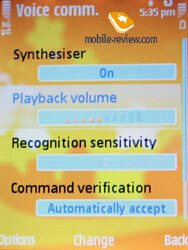 Voice dialing, voice commands. Revamp of the voice dialing package – all settings are gathered under one roof, voice recognition quality has been also addressed by the developers, on top of that you can make the handset adapt to your speech. 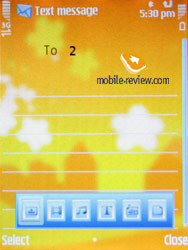 Screen rotation in Nokia Browser. 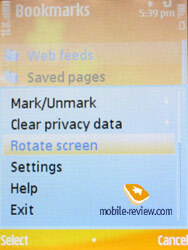 The menu now houses an option for switching the display to landscape mode – the FP1-powered devices boast this capability on the paper, yet it seems to have died on the vine. Music player. 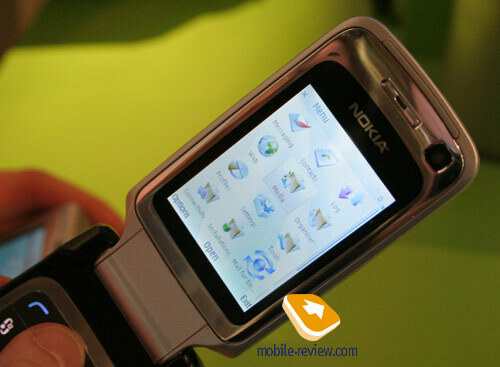 At present the company is aiming to create a new player version that would characterize the next generation of its products, and meanwhile the music player found in the FP2 is identical to that we can see in Nokia N76. Screen resolution. QVGA and bigger resolutions are supported. Update to Feature Pack 2 is evolutionary development of S60 platform, when one can find a couple of really welcome improvements – from full-fledged USB 2.0 to such minor things as animated interface, and enhancement of some functions. On the whole the update pack leaves a positive feeling – all disputes over its being less sharp or harder to use are groundless. At the same time there are some issues that have stayed unfixed for a couple of years now – specifically, missing marking of several items at once in lists, when the user does that by highlighting desired items and pressing OK (in the S60 this action takes thrice as many presses, which is very exhausting and inferior even to the S40). You can rightfully expect the Feature Pack 2 to be the dominating platform for the smartphones market, however offerings employing Feature Pack 1 will be great in number as well. I will take the risk of assuming that the next update kit, Feature Pack 3, for the most part will offer bundled tools for managing maps, that will complement the today’s Framework. In other words, announcement of navigation-capable smartphones is a showcase of what we will see with the advent of next generation of Feature Pack. And I am to get into really wild dreams, then I would say that the fourth edition of the S60 will come included with support for touch screens and hit the market next year (At 3SGM? Why not?). And for the time being we are down to wait for press-releases on first smartphones with Feature Pack 2 onboard, which are to come this spring.